Australian salads feature the best fresh ingredients and if you're looking for a few new recipes to try, we have some great ideas. Many of these salads are extremely simple, though the way that they layer flavors and textures is sure to impress anyone. You will notice that simple dressings resonate throughout the best salad recipes. Dressings are mere accents to the flavors found underneath. From a quick drizzle of olive oil or balsamic vinegar to made-from-scratch sour cream and red wine vinaigrette dressings, keeping it simple allows the base of the salad to shine. Whether you're looking for a satisfying salad for a quick meal or a healthy side dish, your family will not be bored by any of these recipes. Who knows, they may quickly become a new household favorite. Toss this salad together for a quick and flavorful lunch. 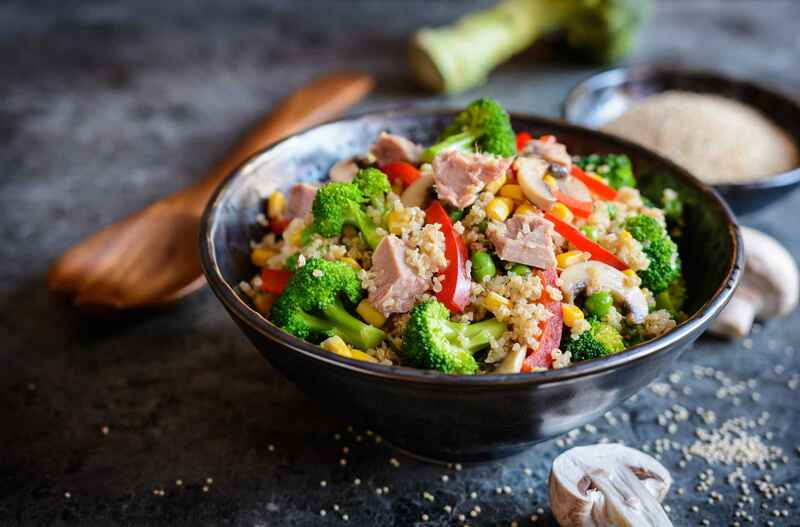 Quinoa and chickpeas are ideal companions for this protein-packed tuna salad recipe that will soon become a family favorite. The layers of flavor continue with cilantro, mint, and spring onions laid over a bed of baby spinach. You'll also love the simple homemade dressing with its snappy garlic taste. Roasted sweet potatoes are a fantastic foundation for a tasty salad. "Kumara" is the Maori name for sweet potatoes and this recipe from New Zealand can be enjoyed as a meal within itself. The soft, roasted kumara are paired with the crispness from romaine lettuce and radishes along with garden-fresh tomatoes. The feta and pine nuts are the ideal topping and you can choose to dress it with olive oil, balsamic vinegar, or even lemon juice. A homemade sour cream dressing brings chicken salad over the top. Grilled chicken breasts and your favorite mix of spring greens form the base for this flavorful salad. Add Swiss cheese, roasted tomatoes, and big, healthy portobello mushrooms and you have a mouthwatering salad just waiting for the spiced, creamy dressing. It's sure to impress the pickiest of eaters and is ideal with a bowl of your favorite soup. Celebrate asparagus season with some action on the grill. When asparagus reaches it's peak, fire up the grill because your family will be delighted with this hot salad. The recipe allows the natural flavors of asparagus and tomatoes to shine. The slightest touch from a balsamic vinegar, garlic, and mustard dressing is the perfect finishing touch. Serve it alongside your preferred barbecued foods. Fresh fruit salad doesn't get much better than this. Strawberry season calls for a lovely fruit salad over a bed of spinach. The flavor pairing is remarkable and it comes together in the quickest way possible. Beyond tossing those two ingredients with sesame seeds, you'll make up a homemade red wine vinaigrette with dill, onion, garlic, and mustard. It's an amazing combination that you simply have to try.